“Hosts” Part 2 of 2 closes the story arc begun in issue #6 (Lowdown here), with a story that does much more than just wrapping what it started, builds on the original episode it is a sequel of, 2X02: The Host, in order to give a detailed origin story for one of the most iconic monsters of the series. At the expense of any actual investigation and any acknowledgement that time has passed since the Mulder and Scully we knew in 1994. This is expanded upon in these two issues, with the lower half of the original flukeman regenerating itself, and with us seeing in flashback the original soup of human, fluke, bacterial infection and radiation coming together to create the original flukeman. 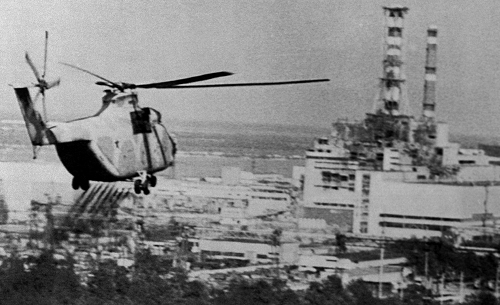 On April 26 1986, the core of the fourth nuclear reactor of the power plant of Chernobyl in Ukraine (then part of the USSR), next to the city of Pripyat (with its characteristic Ferris Wheel), underwent meltdown, leading to explosions and the release of a large amount of radioactive material; the effects were the evacuation of about 200,000 people, an estimated 30 deaths, and controversial numbers of cancers and genetic mutations in children born afterwards. As many as 600,000 clean-up workers were mobilized immediately after the accident and in the years after. Among them, Gregory and Mikhail, soldiers in the Ukrainian military. In typical depictions of the Soviet military as seen by USA residents, their superiors are authoritarian and disregard the value of human life, resulting in Gregory being stuck in drainage sewers and having the radioactive reactor coolant poured over him — Gregory as a Darin Morgan/fluke hybrid is who we follow in 2X02: The Host as he moves from a Russian freighter to New Jersey. The pro-American Dream views are further reinforced with Mikhail Simonov moving to America, the land of opportunity, to make a fresh start, eventually becoming Sheriff Michael Simmons. We get more proof of Harris’ deep research in XF lore with the way Mikhail found out about the reappearance of Gregory/Flukeman: by reading about it in a supermarket tabloid. 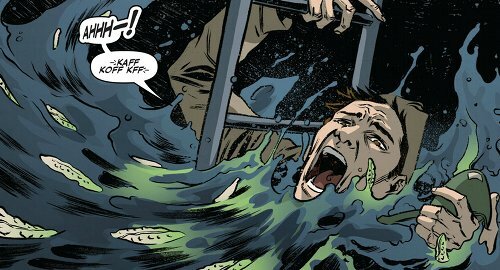 This is the same one we see in the opening of 3X17: Pusher, the “World Weekly Informer“, which explicitly states “Flukeman found washed up in Martha’s Vineyard“, the exact setting of these issues! (thanks to RedKryptonite for pointing this out!) Mikhail makes it his objective to get rid of the monstrosity that he saw being created. Is Mikhail sincere when he tells of this story? Is it possible he was protecting it, seeing in it whatever remained of his old friend Gregory? Or did he just want to put Gregory out of his misery? When Mulder asks him how he knew Gregory was tied to the New Jersey attacks, Mikhail says, stuttering, “I-I am not certain, to be quite honest“. 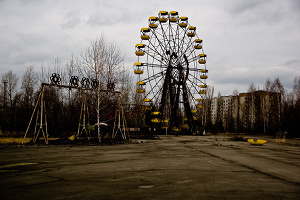 He goes on saying that they were all “damned” that day in Chernobyl, making them destined to find each other through time and destroy each other as well as themselves. Mikhail also says that without Mulder he “would not have located the creature’s lair, or burned it from existence“. Yet Mulder just did the obvious thing, go to the sewers — where he found certain victims tied down with manacles, a feat too complex for just a bunch of flukemen to manage. Were the victims put there for Gregory and his family to feed upon? Were they put there meaning well for the flukemen, or meant as a trap? Perhaps Mikhail burns them as a result of Mulder’s discovery: getting the FBI involved was something he was trying to avoid, either because he wanted these offerings to Gregory and his covering for him to pass unnoticed, or because he wanted to destroy Gregory anyway at some point and Mulder precipitated things. Mikhail burns all the flukemen that had jumped on Mulder, and just when he was about to finish the last one, Mulder draws his attention and the flukeman escapes. Scully operates on Mulder in urgency (reminiscent of 2X17: End Game or 8X15: DeadAlive), miraculously saving him. Mulder and Scully are in no capacity to “sweep the tunnels…just in case” as Mulder suggests, and so there is no way to be sure that every single flukeman was there when Mikhail came in with flamethrowers. Yet, and perhaps he also forgot of the last flukeman who got away, Mikhail files away the missing persons reports, saying “goodnight, tovarisch” as if this was case closed for him. Unfortunately for him, the surviving flukeman (Gregory?) was eavesdropping Mikhail’s confession within the sink of Mulder’s hospital bathroom — and so learns of Mikhail’s identity and that he is a threat, and acts its final bloody, bloody revenge in Mikhail’s bathroom. The narration in this issue is very fluid, moving from the high-action opening to scenes of dialogue that mix present-day scenes with flashbacks. The space taken by the extensive flashbacks to the birth of the Flukeman and by Mulder’s take on events, both very interesting in and of themselves, don’t allow any actual FBI-style investigation to take place. What we end up having is a well-written issue (although with some important remaining questions!) 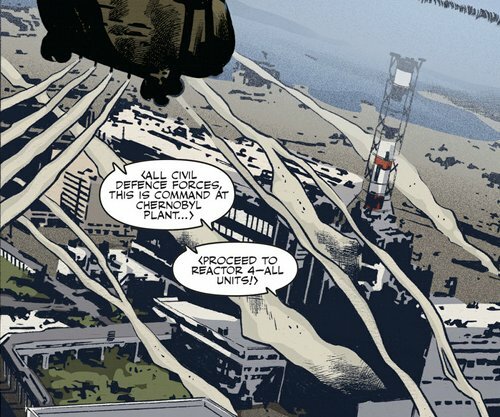 that would be a fitting end to a longer arc that would have had more fieldwork for our agents, however the constraints of the 22-page monthly comics issues are such that resolves things too quickly. 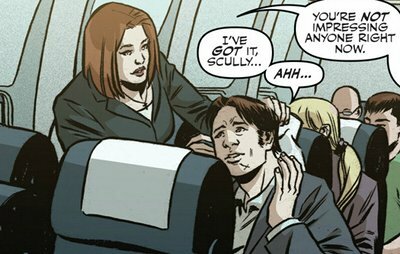 The art is much more creative compared to the previous issue, following Mulder in his unease and even deconstructing the panels to show an abstract depiction of the object of our fears, the fluke, along with its recent victims. Our agents don’t resemble their real-life counterparts consistently, and when they do they look consistently younger. In next issues, we do not see the art team for issues #6-7 again; it looks like IDW is still struggling to find a satisfying approach to this series. The only exception to the otherwise total dedication to make us return to the investigative days of young Mulder and Scully of the 1990s is Mulder’s line “how about the next time the FBI decides to reopen the X-Files division, you and me pass on the sewer-dwelling mon[ster] […] You can’t go home again.” That’s right, Mulder, you are too old for this! This entry was posted on Sunday, December 22nd, 2013 at 12:37 pm	and is filed under Comics. You can follow any responses to this entry through the RSS 2.0 feed. You can leave a response, or trackback from your own site. Oh heck to the yes! You hit the nail on the head with both of these. The first point is part of the reason why I can’t really get into the comics. They seem to be trying to live in the past (for whatever reason) and it kind of bugs me. Like they’re trying to keep fans who like the old look happy along with the rest of the fans. And they can only do it for so long, before people get tired of it. And the second one is a good catch. At least they had Mulder say that. But imho, it doesn’t make up for the ‘living in the 90’s’ feeling that these comics have had to an extent.